Maven is an established build tool in the Java world to automatically build, test, package and deliver applications. The resulting automated build process is repeatable on different machines and enables using continuous integration systems to build and test the application on dedicated servers. Thus, commits from different developers can be integrated and tested immediately, allowing early detection of problems. Software tests can be classified into tests of isolated system components and tests of system component interaction. In this context, we can differentiate between three groups of tests: unit, integration and end-to-end tests. Unit tests examine isolated source code units of a system, e.g. single classes or packages. Integration tests deal with the integration of a system or parts of it with third party systems, e.g. a database or a Java-EE container, in order to see if these interact correctly. In unit and integration tests, dependencies to system parts that are not under test (if existing) must be replaced by mocks. In the context of Rich Web Applications, a common requirement is to test the client independently from the server. End-to-end tests (or acceptance tests) test a system in all its depth, as a black box, including the user interface and the server. The test acts from the perspective of a potential user by controlling the system’s user interface in order to test a certain functionality. Technically speaking, the test fires UI events in an automated browser and defines expectations on the resulting behavior of the user interface. The following code example shows a test of the BlogPostService of the demo application. The test checks if the method fetchBlogPosts() attempts to send a request with expected characteristics to the server (line 15). Note that, by using mocks, we avoid the necessity of a running server during test execution. Jasmine tests are based on the concept of fluent interface: The code is similar to natural language and therefore easier to read. In the given example, we first define a test suite. For this, we call the global Jasmine function describe() using two parameters: A string that defines the title of the test suite and a function that contains the implementation of the suite. A test suite can contain multiple specifications, each implemented using the function it(). This function also expects the two mentioned parameters. Within a test specification, the test expectations are defined via the expect() function. First, in order to access the BlogPostService from the test, the enclosing module must be registered (line 2). Fo this, we use the module() function, an AngularJS extension of the Jasmine framework. Once the module is registered, the service under test can be injected into a test specification using the inject() function (line 10). In this example, we inject the predefined mock service $httpBackend as well as the service under test, BlogPostService. The test specification verifies whether the function fetchBlogPosts() sends an HTTP GET request to a particular URL. For this, we configure the HTTP Mock service with the expected request method and the expected request URL (line 13). Also, we define the mock data (data) that will be returned by the mock service. To ease maintainability, these mock data are defined in a separate JSON file (blog-post-list.json). Now, all expectations are defined and the fetchBlogPosts() function can be called (line 15). As this function is asynchronous, we need to define a callback (success) in order to verify the result (line 16-20). Next, the function flush() of the HTTP mock service is called. It blocks execution until all waiting requests haven been processed. Finally, all expectations are checked (lines 23-25). Our newly defined unit tests can now be executed, as explained later in the Maven integration section. In order to implement end-to-end tests of AngularJS applications, we use the API of the AngularJS Scenario Runner. It enables the test to remotely control the application within a browser. The following test interacts with the user interface in order to create a user account in the blog application. A test scenario is defined in a syntax that is similar to Jasmine. The user interface can be controlled by predefined functions, e.g. navigateTo() in order to access the registration page (line 5). Check this link for an overview of all functions. Once the registration page is loaded, the form data is entered (line 6-10). Afterwards, it is submitted by firing a click event on the submit button. Finally, all expectations are checked, in this case a redirect to the login page. The following section will explain how to execute end-to-end tests. By defining the Maven goal test (line 9), our unit test execution is now linked to the Maven test phase. Thus, they are executed automatically during build, including builds on CI servers. Now, the profile has to be specified when starting the Maven goal bdd. The web application is defined using the return value of the method accessDeployment() (line 5). In our example, we use a self defined helper class MavenDependencyResolver which references and resolves our blog application using its Maven coordinates. Using the test framework Selenium and its WebDriver API we start the embedded browser and run the AngularJS Scenario Runner (step 3) (lines 4, 5). To let the Maven build fail on a test failure, we define two assertions (lines 18, 19). In order to delay checking these assertions until all tests have been executed, the WebDriver has to wait until a certain event occurs. As the Scenario Runner loads the application within an iFrame and removes it after all tests have been completed, the verification of the visibility of the iFrame is a suitable criterion. It makes sure that all tests have been completed and the analysis of the results can begin. The delay logic is defined in lines 7-14. Done! Now, the end-to-end tests are executed during the maven build process. In our first post, we presented a demo application in order to show how to develop Rich Web Applications with AngularJS. We introduced the most important concepts of AngularJS: The extension of HTML by directives, the two-way data binding, the application of the Model View Controller pattern and the routing concept. In this second post we have shown how to implement unit and end-to-end test as well as how to integrate those into a Maven-based build process of a server application. Being a relatively new framework on the field, integrating AngularJS into enterprise applications is more risky than relying on established and standardized solutions. At the same time, the W3C draft “Web Components” submitted by Google is similar to the directives concept and already points in a possible direction of standardization. The concept of directives leads to a distinct separation of static UI description and dynamic UI logic. Views are defined in plain HTML and extended with dynamics using directives, thus achieving a clean separation of presentation and functionality. The two-way data binding renders DOM manipulation code as well as code for monitoring user interactions unnecessary. AngularJS offers a modularization concept to encapsulate related components like controllers and services. Dependencies between modules are resolved using dependency injection, leading to a loose coupling. All these aspects allow for well-testable AngularJS applications. 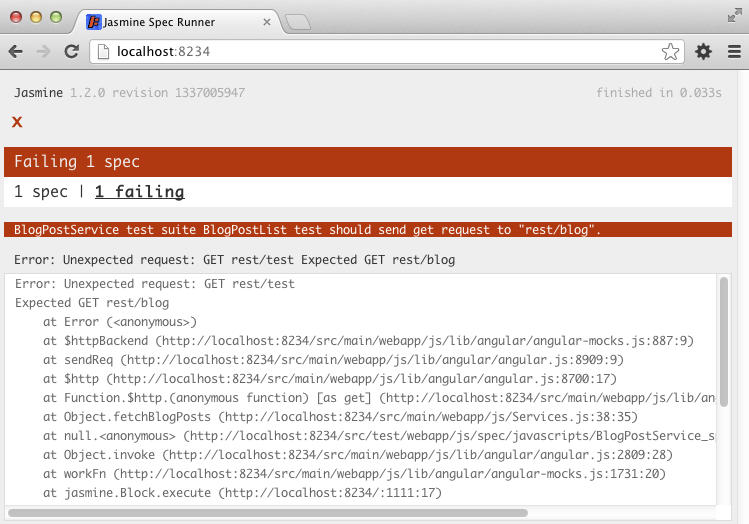 Using Jasmine and the Scenario Runner of AngularJS, we can define both unit tests and end-to-end tests. As shown, the integration of those tests into a Maven-based build process is also possible. While the integration of unit tests via the jasmine-maven-plugin is very easy, embedding the end-to-end-tests is initially a bit more time-consuming. AngularJS applications can be hooked up to arbitrarily complex server backends via a REST interface in a convenient manner, by using predefined AngularJS services. In conclusion, we consider AngularJS to be a very impressive and promising solution. 1/ Arquillian Drone to inject WebDriver instance, e.g. thanks for the input! Especially the runner looks promising, will check it out. i suggest the part 3 : “integrate a osgi architecture” ;-). The jasmine unit tests run fine. The e2e, tho are not what I expected. I was looking more for running the e2e tests using the Karma runner. Any suggestions on how e2e tests using the Karma runner can be run via the maven-jasmine-plugin?